A friend sent me a report he had read on gentrification in Oakland, and asked for feedback, after a conversation in which I claimed gentrification was largely a myth. This is a report in which they are specifically looking for signs of it, trying to play it up, and focusing specifically on neighborhoods and time spans with the most dramatic rent increases. And even by their own numbers, even at its worst rent increased more slowly than inflation. The thing about housing prices and inflation - if a loaf of bread goes up from $1 to $1.50, its not really a big deal, its 50 cents more. If a house goes from 200,000 to 300,000, that seems like a dramatic increase, $100k is a lot of money. But they are both the exact same 50% increase. That is LESS than inflation. In other words, corrected for inflation, rent in the most gentrified part of Oakland has gone DOWN over the time span they looked at. I wouldn't be surprised if this oversight were unintentional. Its why I'd advocate that education move back toward its original general knowledge of everything role instead of the specialist role it has turned into. The people who wrote this are obviously intelligent, but apparently don't know the most basics of economics. They say that "Oakland’s African American population decreased from 43 percent to 26 percent of the population", but not how much the overall population changed. It increased by 20,000 over that time period. That changes significantly the displacement implied by the percentage change. According to their numbers, along with census population data, the city lost 58,476 Black residents over 20 years. A lot, yes, but 30% less than the 85,615 implied by their percentages if you didn't take population growth into account. So, reading this tends to confirm my initial feeling that, while, yes, it is happening, and it has some impact, the people who are against it exaggerate how big an impact it really has. Over that same span of time violent crime has dropped significantly. It is debatable how much of that is due to integration of cultures and classes and how much to other factors. As many Black and poor residents have left, even more have stayed. A decrease in violence and crime is a MAJOR quality of life issue for those who have stayed. There also doesn't seem to be anything to support the assumption that everyone who left did so because of rising rents. Of people I've know who have left, it has been to avoid crime and violence (including moving to places with higher cost of living), out of state for employment opportunities, to be with family, or simply because they didn't like it here. Of course often rent is given as a second or third factor, but then, rent has always been high here, as long as CA has been a US state. SF is second only to Honolulu for highest housing cost - we've actually just barely edged out Manhattan of all places. Oakland is SFs suburb (so to speak). It was expensive before the internet was invented. I'm not going to do the research right this moment, certainly there is nothing in the report that shows that rent increases were any slower prior to 1990. There are some, I'll say, very questionable (at the least) claims. The report states that owners were forced out due to raising prices due to speculation. This makes no sense. If a person "owns" their house (meaning mortgage), the bank doesn't get to unilaterally readjust the loan based on the prices of other houses. The sale price is fixed. At the most the interest can vary, IF the person choose to get an ARM instead of a fixed 30 year. At the worst, they may become "upside down" or "underwater" - but unless they themselves were speculating - planning to sell before the loan was paid off - those ideas are meaningless. If a person has paid off the mortgage, then the prices of neighboring homes has absolutely zero impact on them in any way. The report also states that because rental prices increased, tenants had to live in deplorable conditions without necessary upkeep. Its a non-sequitor, and they make no attempt to explain the claimed correlation. -Planning as a participatory process, including practices to build greater participation, accountability, and transparency into local land use and development decision-making. However, I think these ideas should most definitely be IN ADDITION to those policies they explicitly say they are in contrast to: " transit-oriented development (TOD), mixed-income development, and deconcentration of poverty approaches." There is some value to empowering local communities, but at the same time, not every individual in the communities want to be empowered in that particular way (participating in the civic process), and there are both cultural and educational hurdles in the way of simply handing over the (metaphorical) keys and saying good luck, hopefully you'll work something good out. Further, there are more goals to city management than just avoiding displacement. Transit oriented development, for example, is important for reducing environmental impact. We shouldn't be pitting poverty and ecology against each other. Nobody wins. More over, there are some big philosophical questions that the entire concept raises. Some really major ones are the entire concept of owning land which other people live on. On that question I am way more radical than anything in this report: in short, I don't believe society should have landlords, period. I have a major problem with capitalism in general, and developers particularly. Short of revolution or a total change in American mindset, at the very least I totally support changes and restrictions on the activities of developers and landlords that benefit tenants and/or encourage home ownership, as well as changes to zoning regulations. Who gets to decide who is entitled to live where? What gives any particular person the "right" to live any particular place? Housing is expensive here because everyone wants to live here. We have good weather, good people, good politics, the city is close to nature, jobs pay well, we have good civic infrastructure. People come from all over the country, and all over the world, to live here. People move in faster than they move out. But the major central cities have a fixed size. The more population grows, the more crime grows, the more traffic grows. I was born here. This is home to me. But in America, anyone can move to any state they want, any time. Poor people should have a right not to be evicted from their home for no other reason than the landlord wants higher rent. And so rent control laws were put in place. But if a person chooses to move, or they are evicted for bad behavior, should they have a "right" to be able to move to the Hollywood Hills, or Honolulu HI, or Marin or Silicon Valley? And if poor people do have a "right" to live where ever they want, why shouldn't the middle class and wealthy have that same right? On what basis can we say that anyone person has a right to live in a particular city, but another doesn't? What solution is there other than a market based one if more people want to live in some places than others? Do you pick an arbitrary population and put up a big CLOSED, NO VACANCY sign on the city limits? Limiting development means preventing the housing supply to expand. If population expands while housing doesn't, rent prices increase. Basic supply and demand. To me it doesn't make sense to oppose turning apartments into condos, while at the same time supporting programs to encourage first time home buyers and ownership coops. I think increasing ownership is a positive goal. The more units that are turned from rentals to owen occupied, the more ownership is increased. I only skimmed everything beyond the beginning, because it is all an elaboration of the first points. 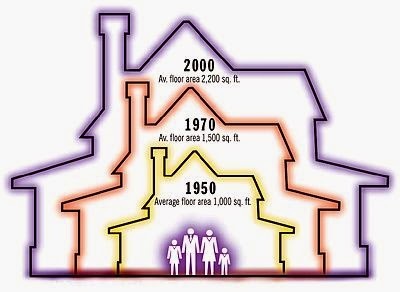 Homes have steadily gotten bigger since 1920 - in fact, well over twice as big, on average. A house with 3000 square feet should reasonably cost more to buy or rent than a house that is 750 square feet. The more big houses there are, the higher the average size will be, and so average cost should go up accordingly. Bay Area population grows steadily over time. Housing is not infinite, so the same supply and demand curves that affect every other area of economics in a free market affect housing too. This is a good thing, because otherwise demand would be overwhelming, and the effects on urban density, traffic, government services, crime, the environment, etc would be extreme and negative. Not everyone in the world can live here - there just isn't space. This is completely independent of how much money the people who move in make. If more people move to an area, it reduces the amount of housing, and reduced supply with increased demand always increases prices. In fact, the more subsidized housing is available, the more sharp that effect will be, as it encourages more people to move in! 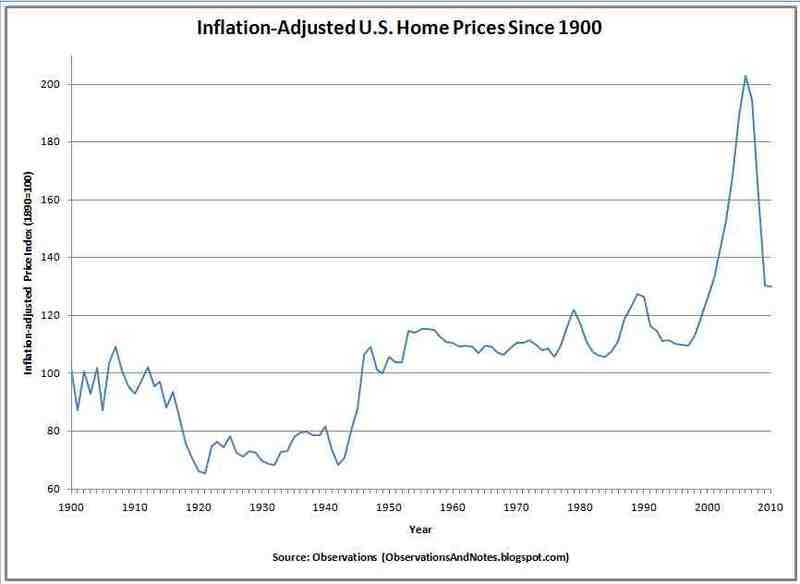 But as the charts show, even after the effects of bigger houses and more demand from a growing population, rent and home purchase prices still grow negligibly faster than inflation over the big picture. Sure, there are random bubbles here and there. But overall, gentrification is a myth.